Bread holds no secrets for Le Cordon Bleu Chefs. 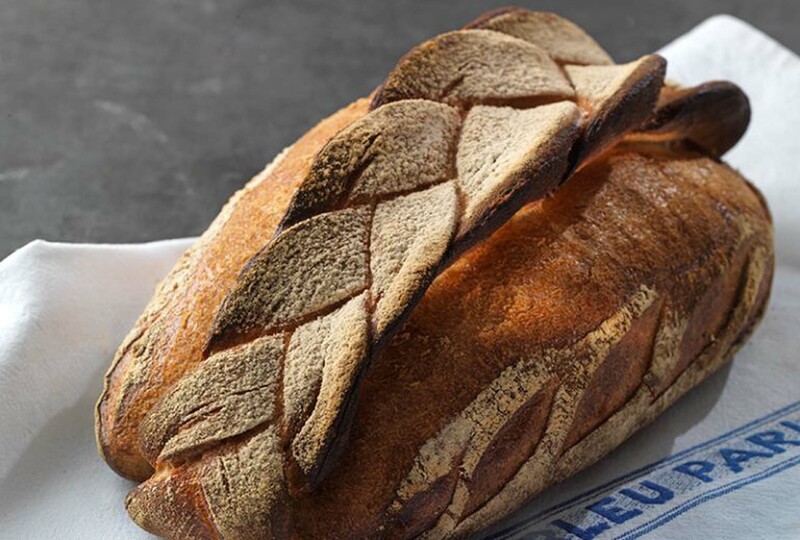 They have chosen one of the classics of French breadbaking, country bread made with fermented dough. Fermented dough: dissolve the yeast in the cold water using a whisk. Add the flour, then salt. Knead for 10 minutes. Cover the bowl with plastic wrap and leave to rest overnight in a refrigerator at 5 °C. Dissolve the yeast in the cold water using a whisk. Add remaining ingredients and the fermented dough; mix together by hand or with a wooden spoon until a smooth dough has formed. Knead by hand or in a machine at low speed using a dough hook for 4 minutes to combine the ingredients; switch to medium speed for 6 minutes. Proving: Cover the bowl with a cloth and leave at room temperature until the dough doubles in size, approximately 1 hour to 1 1/2 hours. Divide the dough into 3 portions (approximately 350 g each). Allow to rest for 15 minutes at room temperature. Take one portion of dough and with a rolling pin roll one end into a long flat tail. Cut the tail into three strands, keeping them still connected to the main dough. Braid the strands together: Brush the sides of the braided tail with a little olive oil. Lift up the very end of the tail and lay it back over the main dough, using a little water brushed on the braid to help it stick. The end of the tail should meet just at the other end of the body. Repeat the operation with the remaining two portions. Second proving: Allow to rest for 45 minutes to an hour at room temperature. Preheat the oven to 240°-250°C. Place the three shaped portions of dough onto a baking sheet and sprinkle with some flour, slash decoratively on the sides with a sharp razor directly before baking.